1. Old School Quickies. Bucky Badger's full name is Buckingham U. Badger. Is Minnesota's Golden Gopher that sophisticated? I doubt it. 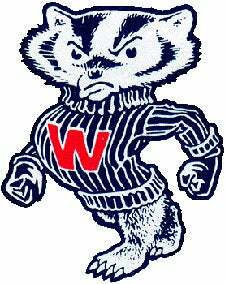 The Badger mascot actually stems from when the territory was dubbed "The Badger State," not because of animals in the region, but rather an association with miners in the 1820's. Prospectors came to the state looking for minerals, and without shelter in the winter, they had to live like badgers in tunnels burrowed into hillsides. Speaking of back in the day, annual tuition in 1900 was $20. Now that would really make paying off school loans a lot easier. One last fact: Did you know 17 Nobel Prizes and 24 Pulitzer Prizes have been awarded to UW alumni & faculty? 2. What You Need to Know About This Team. There's quite the range of personalities on this squad. Forward Marcus Landry says his dream job is a pastor, while guard Trevon Hughes simply states "Victoria's Secret." Uh, OK. Sophomore forward Kevin Gullickson says the best movie he's seen this year is Clerks II. Kevin, go see some more movies. Brian Butch's favorite TV show is "Grey's Anatomy." Do with that what you will. I'm going to cut him some slack after his elbow ended up on the wrong side of his arm against the Buckeyes.